Bujinkan Ninjutsu is an interesting, practical and fun way to get fit!! Interesting: over 900 years of Ninja and Samurai history and tradition, passed down orally and in secret scrolls from consecutive grandmaster for 34 generations. Practical: The methods and philosophies transmitted through the generations have been formed through the ages and on the battle fields of ancient Japan, to create a pragmatic, simple and efficient form of self-defence and preservation. Fun: The ninja of old learnt that to cope in difficult situations it was important to have fun, so we enjoy what we do and create an atmosphere of fun, this also speeds up the learning process. The Bujinkan was the first modern Ninjutsu organisation in the world, established in 1972 it is an amalgamation of 9 Ryu (schools) some dating back over 900 years and was initiated by Grandmaster Dr Maasaki Hatsumi. It has more than 300,000 members worldwide. The Bujinkan Brighton Dojo is now officially known as the Bujinkan Myabiryu Dojo (Brighton), Myabiryu being Shihan Jake’s warrior name and to recognise its more universal nature. 19th January 2014, Noda-shi, Japan. Jake Jugodan, is awarded the Bujinkan gold medal by Dr Masaaki Hatsumi Sensei, this is for distinguished service to the Bujinakan. It is an amalgamation of 9 schools (ryu) some ninja some samurai, handed down orally and directly from Grandmaster to Grandmaster for 34 generations to the current living grandmaster -Dr. Hatsumi, thus forming an unbroken chain of knowledge dating back over 900 years. Head Instructor of the Brighton Dojo (training hall) Jake Sharpstone 15th Dan -Shihan, is licensed to teach these skills by Dr. Hatsumi. These skills are appropriate today as they were 1000 years ago. So learn to defend yourself and others with this fascinating and historical art whilst developing yourself with all the other benefits such as fitness, flexibility, balance, good health and mental focus. 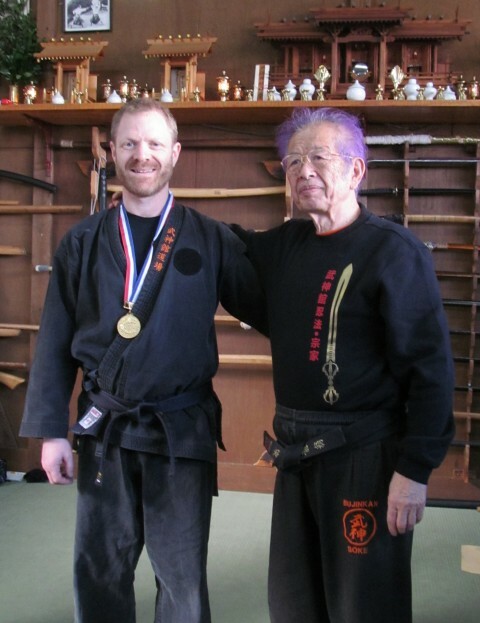 There are 9 ninja and samurai schools handed down to Dr. Hatsumi and taught by the Bujinkan. Training is with and with out weapons, against punches and kicks and single and multiple attackers. In a relaxed and informal environment – promoting good health and injury prevention. Ninjutsu is a real martial art which means it main purpose is for self-defence, designed to enable a person to defend themselves and others from possible heavier, larger and stronger attackers, by learning and practising clever, controlled balance taking and striking to an attackers weak points, therefore powerful techniques are performed in very carefully controlled manner and competitions are not possible or recommended. Also as Ninjutsu is designed for personal safety and possible real live confrontations, disabling, subtle techniques are taught, very different from sport “martial arts” that are designed for competitions with rules, regulations and referees and just one one one. 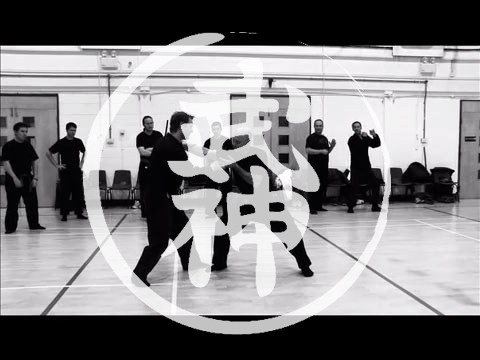 So if you are looking for Martial Arts in Brighton come and try us out! 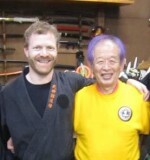 The Bujinkan is truly a great International organisation!